Thanks to Dale Leech, grandson of Ruby Marie Axtell [10-364c] for the pictures and information. "J.T. Axtell, M.D. was a noted surgeon, educator, author, entrepreneur, philanthropist, builder and Christian leader. He took pride in advancing medicine in this community and was the founder of Axtell Hospital, Axtell Clinic, and one of the first formal schools of nursing in Kansas." 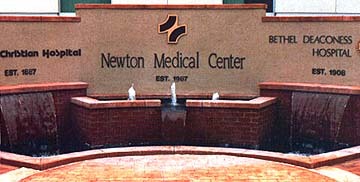 The bust (above right) is to the left of the sign at Newton Medical Center (right). 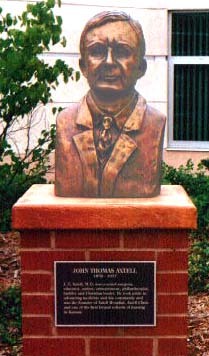 Dale got in touch with staff at the Axtell Medical Clinic in Newton and found that John Thomas Axtell M.D. still has two grandchildren living in Newton, along with a great-grandson who is an M.D. on the clinic staff and two great-grandsons-in-law who are also M.D. 's on the clinic staff. The original name was "Axtell Hospital" as shown on the facade of the older building. In 1924, Dr. Axtell gave the hospital to the State Convention of the Disciples of Christ and the name was changed to Axtell Christian Hospital. The current sign (pictured) shows that Axtell Christian Hospital, founded 1887, merged with Bethel Deaconess Hospital, founded 1908, to form Newton Medical Center in 1987. The 1945 Genealogy says he founded the hospital the same year he got his M.D. from Bellevue Medical College, in 1883. There is also an Axtell Road in Newton. Back to Axtell History Album.